haha… I get it…McCain is the special needs child! Wow is this site slighted against republicans or what ? 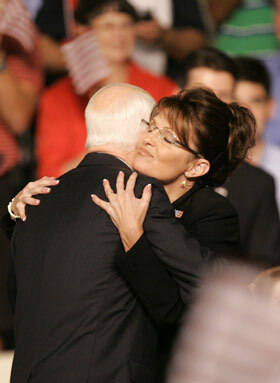 You guys do realize that mccain knows that he is doing more than palin right ? Now McCain has two women to take care of him: spoon feed him his Gerber and change his diaper. I think what some of you are missing is that McCain appears to be hugging her similar to someone with “special needs”. Is it just me or does he look even older (if that’s possible) from behind? I’m not from the US, so can anyone explain who the hell Sarah Palin is and why did she set the news on fire all of a sudden? @Matt Kirby: You do realize that McCain is a frail old fat man who will die if he catches a cold, and even if he doesn’t he’s a heart attack risk waiting to happen? @Namelis: She’ll be the vice president on the off chance that McCain wins. Basically the job of the vice president is to be president if the president dies. Though now it seems the job’s for whoever’ll help most with the election; everything else is tangential.